Tickets $14. Available now online at Ticketweb.ca (bit.ly/BBIPYYJ) and in-person at Lyle's Place. Find more information about this unique festival visit our website www.bamboobassfestival.com and truly consider treating yourself to a vacation experience of a lifetime. WIN FREE TICKETS TO BAMBOO! We will have (2) Bamboo Bass Festival tickets to give away at the event. Illvis Freshly is a funky, bass heavy, hip-hop monster. They’ve blended the classic sample heavy hip hop sound of the 90s with live rock n roll, guitar, rapping, and turntablisim. The two MCs, Danimal House and Doc Zoo, bring high energy, raw, and unforgiving lyrics with crazy flows and a wide variety of content and themes. DJ Mt Doyle is always on point, scratching, mixing, and keeping the party live. Phil Lyons absolutely shreds the guitar, captivating the crowd with face melting riffs and his ridiculously entertaining antics. Illvis Freshly’s debut LP entitled “What Chu Know About Illvis?” received huge support from the world-wide hip hop, funk and electronic scenes. 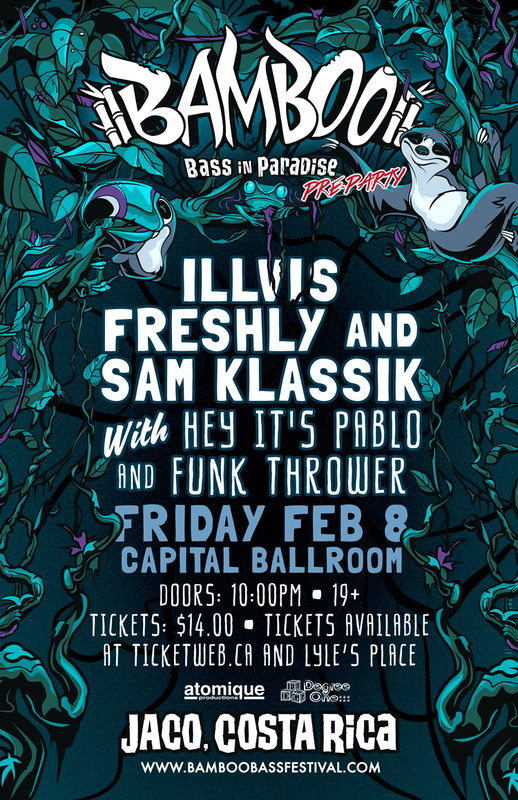 A diverse collection of remixes from artists stretching from Vancouver Island all the way to the UK and New Zealand helped establish Illvis Freshly as one of the most progressive, accessible and fun acts in Canadian hip hop. This momentum was recognized in 2015, as Illvis Freshly won Best Urban/Electronic Recording for their song “On The Breaks” and Group of the Year from the Vancouver Island Music Awards. In November 2016 they released their sophomore album, “Illennials,” a take on our current state of affairs regarding everything from politics to the disenfranchised millennial generation. The album charted on numerous campus radio stations across Canada and also received commercial plays, with “Upside Down ft. Caleb Hart” being selected as the January single for Victoria radio station The Zone 91.3’s Band of the Month program. Illvis Freshly continued their streak of success at the 2016 VIMAs, again winning Group of the Year and again winning Best Urban/Electronic Recording, this time for “Upside Down ft. Caleb Hart”. 2017 was another groundbreaking year for Illvis Freshly, completing their first extended tour, playing their first shows in both Alberta and California, and perhaps most importantly, cooking up a whole new batch of funky tunes for their upcoming project in 2018. Illvis Freshly has become a staple in the west coast music scene, bringing their feel good party vibes to a number of amazing festivals including Atmosphere Gathering, Shambhala Music Festival, Rifflandia, Electric Love Music Festival, Fozzyfest, Boogaloo Music & Art Car Festival, Kamp Festival, Song and Surf, the High Times Cannabis Cup Canada, Quadrapalooza, Victoria Ska and Reggae Festival, the Five Acre Shaker and Tall Tree Music Festival. Whether it’s busting a move on the dance floor, rocking out to a killer guitar solo or being blown away by some thought provoking lyrics, Illvis Freshly has a little something for everyone. Come find out for yourself what the west coast just can’t seem to get enough of. Sam Klassik is a manifestation of organic and electronic cross pollination. Using mixing and living looping, swaggy guitar riffs over crushing bass, he weaves up experiences that have rocked dance floors at some of the worlds best festivals, like Envision, Shambhala, Electric Forest, and Sonic Bloom. Highlights include winning 2 sets at Electric Forest through their instrumental contest, a viral video with 5 million views, guest work with The Funk Hunters and Chali 2na, Defunk, Stickybuds, EVeryman and more. 2017 tour included 15 world class festivals and 40 other dates.